Couples counselling (which can also be referred to as marriage guidance) is a form of therapy that looks to improve communication and resolve issues within an intimate relationship. Couples counselling is a term applied to therapy for two people within a relationship. Couples counselling is ideally suited to couples attending the sessions together. However, if your partner is hesitant in attending, you can speak to a couples counsellor on your own to begin with. You may find your partner wants to join you after you have had some initial sessions alone - or you may find it helpful to intersperse couple sessions with individual sessions. It is important to remember that when you go to couples counselling you will not simply be told what to do. Your counsellor will offer their professional opinion and you will not be told whether or not you should separate. The role of a couples counsellor is to facilitate change and resolution by helping a couple to communicate more effectively and reach their own conclusions under the guidance of a professional. During sessions a couples counsellor will ask you either to do a task or discuss something specific, and then to discuss any challenges you came up against and how the experience made you both feel. If you are nervous about discussing private matters with a stranger, keep in mind that your counsellor is not there to criticise you; your counselling sessions should be a space free of judgement where you can explore your actions openly. How is Couples Counselling beneficial? If you are concerned about any aspect of your relationship and feel you are unable to reach a conclusion alone, it is likely that you will benefit from couples counselling. Every couple is different, so when you choose to seek help will depend on the nature of the issue you are facing. For some, couples counselling is considered as a 'last resort' to save a relationship/marriage. While this is sometimes the case, you should not wait until things get that bad before trying couples counselling. 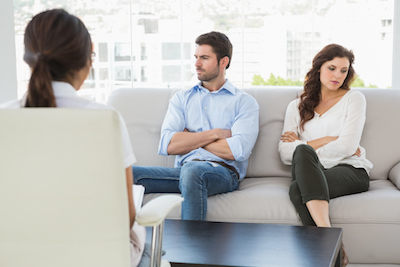 Many couples use such therapy sessions as a way to keep their relationship healthy and address any underlying concerns that may become conflicts in the future. Couples counselling offers a couple to the chance to speak to someone with no preconceived notions of who you are as a couple, with the added bonus of having skills and training behind them to guide you through your concerns. Sometimes talking to someone with no connection to yourself or your partner is all it takes for you to gain perspective on a situation. Through couples counselling, a couple may find a way of overcoming your problems, or you may decide it is time to part ways. Either way, hopefully counselling will offer you the space to grow and decide what you would like the future to hold for both of you. At GoMentor.com we have many verified couples therapists who can help you with any relationship/marriage issues that you and your partner are struggling with.